I feel so bad that I have been neglecting the blog so much this month, but I have been swamped getting ready to have a booth at the Seasons of Aggieland Bazaar at the end of the month! I am so excited to be participating in my very first craft fair but I am terrified all at the same time. I've been super busying sewing and sewing and sewing some more to get ready. I have been doing tons of research about how to set up a booth, how much inventory to have, what displays to have, and so on. It is so much information I find myself getting very overwhelmed and needing to take a step back. I wish that my mom could make it into town and help me out with it, but she has to work both days. Luckily I will have my sister and several friends who can help with the craziness. I'm trying to get as much done as possible before we leave for Disney World on Monday, and I'm actually making pretty good progress. 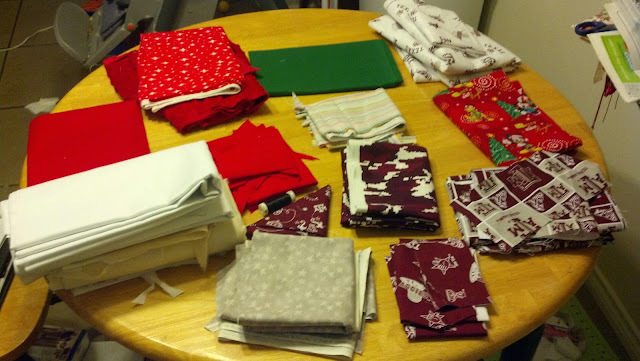 I've got most of the stockings that I am making completely cut out and sorted, and I am in the process of getting everything else cut. Since my table is so small, it works better to cut everything first so that I don't have to keep moving my machine between projects. Here is some of the fabric that I am using. 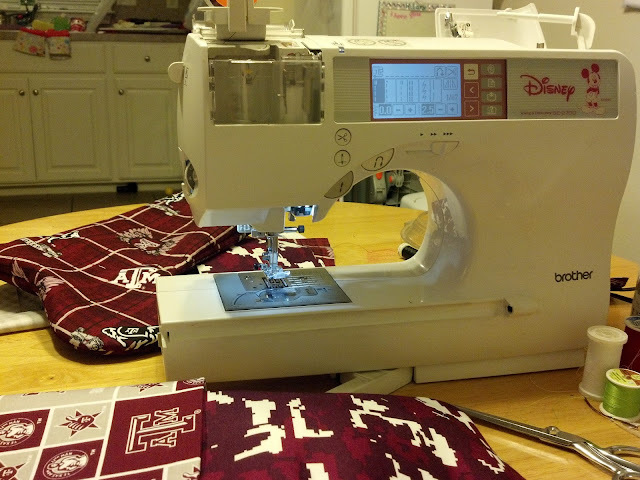 Since it is the Seasons of Aggieland Bazaar, I am making most of my items from Texas A&M fabric, but I'm also making some items from Christmas fabric. I have about 50 yards of fabric that I got at an amazing buy 1 yard get 1 yard free sale at the quilt shop around the corner from me. My darling sewing machine. I have had this one for about 7 years and I adore it. It has the attachment to be able to do embroidery too, and I love that I have that option! This was the very first stocking I made and just for grins I put it on Etsy just to see how much traffic it got. I was so shocked/excited when it sold only a couple days after I posted it! Hopefully that is a good sign that the craft fair is going to be really successful. I hope everyone is having an amazing weekend so far! I've got to get back to work :) Does anyone have some tips on what worked best for you at a crafts fair? Or what draws your attention most when at a fair?